The scavenged wood lasted long enough to keep us warm, but we had more or less run out of coal by the time we were back at Kidderminster. 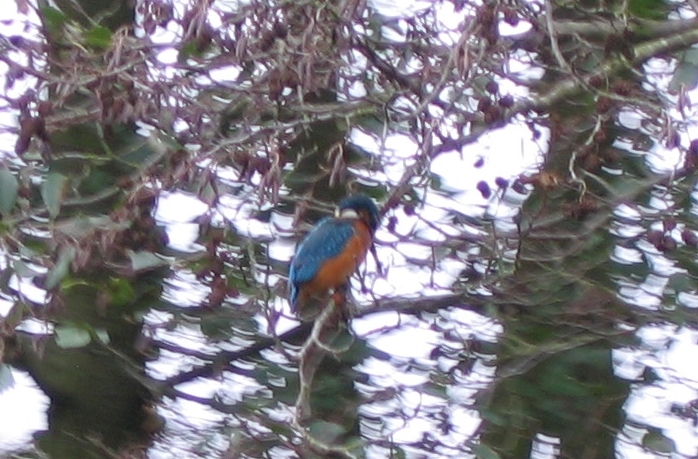 We saw the kingfisher again on the same stretch by Wolverley Court lock. This time we had the camera ready. On returning we tried out a new technique for getting into the mooring. We can only get onto the angled finger pontoons if we are heading north. Previously, if were were coming southbound, we would go down through Caldwell lock, wind just before Falling Sands lock, and then back up Caldwell lock. This time we decided to wind in the wide space by Tesco and then reverse back the 200yds or so to the mooring. It worked OK, a bit hairy reversing under the bridge on a bend, but I think with practise we should do it easier in future.